Does my Dog or Cat Need Chiropractic Care? Chiropractic care can help a variety of issues including arthritis, muscle pain, nerve problems, luxating patella, secondary effects of hip or elbow dysplasia, and post-surgical cases. Chiropractic care is not only for injured or sick pets, it is a crucial component of preventative care for your animal to ensure they live long and healthy lives. Initial assessments involve gait analysis, range of motion testing, and palpation of joints and muscles to determine problematic areas. Chiropractic adjustments and myofascial work are then carried out to improve joint mobility, decrease muscle tension, reduce pain and improve the overall condition of the animal. Chiropractic treatments include spine adjustments, extremity stretching and adjustments, myofascial release and rehabilitation advice. Chiropractic treatments can take anywhere from 25-45 minutes depending on the condition of the dog or cat. 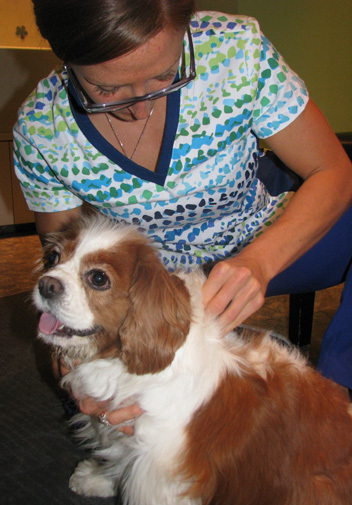 Treatment schedules for chiropractic care will be determined based on the animal’s needs. Many pet owners find it difficult to tell if their pet is in pain or discomfort. Important: If you see your animal slip, fall or possibly injure themselves, it is best to get them checked. Even if they seem completely fine, they can have an injury such as a sprain/strain that may cause them more serious problems down the road! Often times pet owner’s witness an injury (slip or fall) and assume their animal is fine because they are not limping or do not seem “in pain”. This is not the case. Because animals have four limbs, they can more easily compensate for their injuries versus humans, making the ailment harder to spot.